Eighteen years after the signing of the Khasavyurt Accord that ended the 1994-96 Chechen war, a veteran Chechen field commander has issued a timely reminder that there are still three sides to the ongoing struggle for the hearts and minds of the Chechen people. 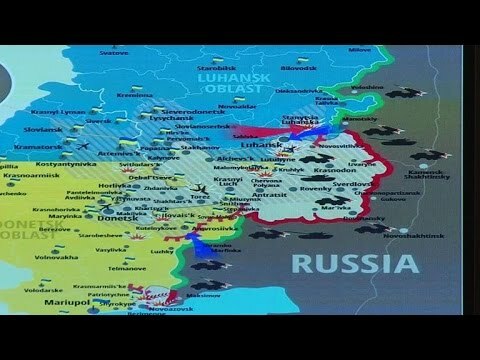 In a statement dated August 28, Isa Munayev appeals to the United States and "the countries of the democratic world" to provide "comprehensive military assistance" to the Ukrainian people, whom Munayev describes as victims of Russian imperial aggression, just as the Chechens were 20 years ago. Munayev identified himself in that statement as commander of the Dzhokhar Dudayev international volunteer peacekeeping battalion and a brigadier general of the armed forces of the Chechen Republic Ichkeria (ChRI) of which Dudayev was the first president. He spoke to RFE/RL's Radio Marsho a week ago, shortly before he travelled to Ukraine to show "international support for the Ukrainian people." The strength of his battalion, and who is bankrolling it, is not known. Now in his late 40s, Munayev played a key role in the defense of Grozny at the start of the 1999-2000 war, and continued fighting after the resistance forces retreated south to the mountains, acquiring a reputation for his courage and tactical skills. In late 2007, however, he distanced himself from ChRI President Doku Umarov following the latter's abandonment of the cause of Chechen independence and proclamation of a Caucasus Emirate. Munayev left Chechnya soon afterward, but continued to serve until December 2008 as ChRI prosecutor-general. Meanwhile, evidence continues to mount of the presence on the side of the pro-Russian separatist forces in eastern Ukraine of hundreds of fighters sent by Chechen Republic head Ramzan Kadyrov. Those fighters are apparently primarily volunteers from among the various police and security forces subordinate to Kadyrov, who has consistently denied that there are any "Chechen battalions" in Ukraine, even after the "Financial Times" quoted a fighter named Zelimkhan who said he and his comrades in arms had been sent to Ukraine in mid-May on Kadyrov's orders. Kadyrov has admitted, however, that a few dozen Chechen volunteers from among the 2 million (according to his estimate) Chechens living outside Russia have travelled to Ukraine on their own initiative to fight, and that a handful of them have been killed. Republic of Ingushetia head Yunus-Bek Yevkurov similarly said in early June that 25 residents of his republic had travelled to Ukraine to fight, of whom four had been killed. In a subsequent interview, Yevkurov, a former Russian military-intelligence officer, affirmed his readiness to head to Ukraine himself "to defend those who are being humiliated and killed." In contrast, both the Defense Ministry and the presidential and government press service of the largely unrecognized Republic of South Ossetia in May denied media reports that the breakaway Georgian region had sent volunteers to fight in Ukraine. How many "kadyrovtsy" either volunteered or were sent to Ukraine is unclear, but separate, unconfirmed casualty reports suggest the figure may have been as high as 1,000. Between 35-45 corpses were reportedly sent back to Chechnya in late May, and between 120-150 in August. In addition, Ukrainian military sources claimed to have killed some 200 Chechens near Slovyansk in late June. Other reports, also unconfirmed, suggest that Kadyrov's men did not distinguish themselves in battle. There have been several such reports over the past few weeks that Chechen units fighting under the command of Russian officers in eastern Ukraine have been disbanded and sent home for cowardice and/or desertion, surrendered to Ukrainian government forces, or asked for safe passage to retreat to the Russian border. Kadyrov immediately rejected as untrue reports that any Chechens had surrendered: he declared that "once a Chechen takes up arms, he doesn't surrender." This blog presents analyst Liz Fuller’s personal take on events in the region, following on from her work in the “RFE/RL Caucasus Report.” It also aims, to borrow a metaphor from Tom de Waal, to act as a smoke detector, focusing attention on potential conflict situations and crises throughout the region. The views are the author’s own and do not represent those of RFE/RL.